1. Framing Members* - Floor and Ceiling Runners — Not shown — Proprietary channel shaped, min. 3-5/8 in. wide, fabricated from min. 0.015 in. (min bare metal thickness) galvanized steel, attached to the supporting structure with fasteners 24 in. OC max. Configurations B and C shall utilize two, separate tracks along the floor and ceiling. Effective thickness is 0.034 in. 1A. Framing Members* - Floor and Ceiling Runners — Not shown — Proprietary channel shaped, min. 3-5/8 in. wide, fabricated from min. 0.015 in. (min bare metal thickness) galvanized steel, attached to the supporting structure with fasteners 24 in. OC max. Configurations B and C shall utilize two, separate tracks along the floor and ceiling. Effective thickness is 0.034 in. 1B. 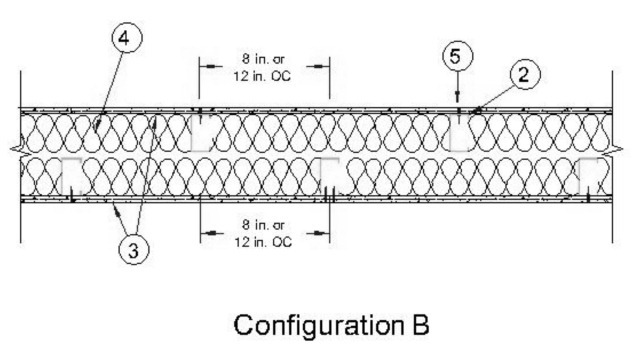 Framing Members* - Floor and Ceiling Runners — Not shown, for use with Item 2B — Proprietary channel shaped, min. 3-5/8 in. wide, fabricated from min. 0.018 in. (min bare metal thickness) galvanized steel, attached to the supporting structure with fasteners 24 in. OC max. Configurations B and C shall utilize two, separate tracks along the floor and ceiling. 1C. 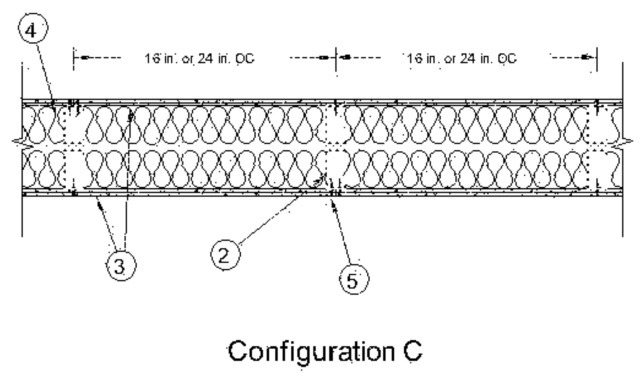 Framing Members* - Floor and Ceiling Runners — Not shown, for use with Item 2C — Proprietary channel shaped, min. 3-5/8 in. deep, attached to the supporting structure with fasteners 24 in. OC max. Configurations B and C shall utilize two, separate tracks along the floor and ceiling. 2. Framing Members* - Steel Studs — Proprietary channel shaped studs, min. 3-5/8 in. wide, fabricated from min. 0.015 in. (min bare metal thickness) galvanized steel, spaced a max of 24 in. OC. Studs attached to the floor and ceiling runners with 7/16 in. long, No.6 steel screws on both sides of the stud. For locations that are not accessible for mechanical fastening, the flange of the stud shall be fastened to the track by tack welding. Effective thickness is 0.034 in. 2A. Framing Members* - Steel Studs — Proprietary channel shaped studs, min. 3-5/8 in. wide, fabricated from min. 0.015 in. (min bare metal thickness) galvanized steel, spaced a max of 24 in. OC. Studs attached to the floor and ceiling runners with 7/16 in. long, No.6 steel screws on both sides of the stud. For locations that are not accessible for mechanical fastening, the flange of the stud shall be fastened to the track by tack welding. Effective thickness is 0.034 in. 2B. Framing Members* - Steel Studs — For use with Item 1B. Proprietary channel shaped studs, min. 3-5/8 in. wide, fabricated from min. 0.018 in. (min bare metal thickness) galvanized steel, spaced a max of 24 in. OC. Studs attached to the floor and ceiling runners with 7/16 in. long, No.6 steel screws on both sides of the stud. For locations that are not accessible for mechanical fastening, the flange of the stud shall be fastened to the track by tack welding. 2C. Framing Members* - Steel Studs — Proprietary channel shaped studs, min. 3-5/8 in. depth, spaced a max of 24 in. OC. Studs attached to the floor and ceiling runners with 7/16 in. long, No.6 steel screws on both sides of the stud. For locations that are not accessible for mechanical fastening, the flange of the stud shall be fastened to the track by tack welding. 3. Gypsum Board* — Nominal 5/8 in. thick, 4 ft. wide panels, applied vertically to studs and runners with 1-1/4 in. long, No. 6, Type S screws spaced at 8 in. OC along the perimeter of the panels and 12 in. OC in the field. Vertical joints centered over studs and staggered one stud cavity on opposite sides of stud. Horizontal joints of vertically applied panels to be staggered 4 ft on opposite sides of the wall. 3A. Gypsum Board* — Any 5/8 in. thick UL Classified Gypsum Board that is eligible for use in Design Nos. L501, G512 or U305. (As an alternate to Item 3; on only one side of the assembly, for use only in Configuration A, when the studs are spaced 16 in. or 24 in. OC) — Nominal 5/8 in. thick, 4 ft. wide panels, applied vertically to studs and runners with 1-1/4 in. long, No. 6 Type S screws spaced at 8 in. OC along the perimeter of the panels and 12 in. OC in the field. Vertical joints centered over studs and staggered one stud cavity on opposite sides of stud. Horizontal joints of vertically applied panels to be staggered 4 ft on opposite sides of the wall. Horizontal joints of vertically applied panels need not be backed. 4. Batts and Blankets* — UL Classified glass fiber insulation with or without kraft paper facing, nominal 3-1/2 in. thick, nominal density of 0.95 pcf, friction fit between studs to completely fill the stud cavities. See Batts and Blankets* (BKNV and/or BZJZ) Categories for names of Classified companies. 5. Joints and Screwheads — Joint compound applied in two coats to joints and screw heads. Paper tape, nom 2 in. wide, embedded in first layer of compound over all joints. 6. Furring Channels — (Optional, Not Shown) — Resilient channels fabricated from min 25 MSG corrosion-protected steel, spaced vertically a max of 24 in. OC. Flange portion attached to each intersecting stud with 1/2 in. long Type S-12 steel screws.